"...we only have to rest and walk in what He has already made us to be." Continue reading Is Flirting Cheating? "It felt as if I could lose God's gracious salvation simply by being clumsy or forgetful." "If we choose to follow Him and be transformed from what we were, then we must remember our true value is not in what we have done but in what He has done." "God gave each one of us a 'trust' fund as it were and we are responsible for how and in what or whom we invest it." "There is more to accepting this matchless gift of rescue, redemption, and reconciliation than merely acknowledging its receipt." "God’s desire for us is so great that He doesn’t want a relationship with just some of us but all of us." Trust and Rest in Him! 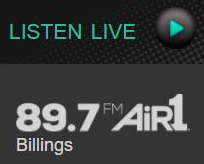 Click image to listen now or tune in at 90.9FM Billings! Click image to listen now! Explore the rich Hebrew heritage that is the root of our Christian faith with John Parsons!